In September, 35 stocks repurchased 32 million shares for a total consideration of S$94 million. The buyback consideration has brought the total consideration over the first nine months of 2018 to SS$1.3 billion, which is 3 times the total buyback consideration in 2017. The 35 stocks included seven STI constituents - DBS, OCBC, CDL, SGX, Sembcorp Industries, UOB & SATS. Buybacks by these seven stocks made up as much as S$80 million, or 85%, of the S$94 million in consideration. DBS led the September tally with the buyback of 2.25 million shares for a consideration of S$55 million. The largest buyback consideration posted by a non-STI stock was from Silverlake Axis, which bought back 6 million shares for a consideration of S$2.5 million. Total share buyback consideration for the month of September totaled S$93.6 million. 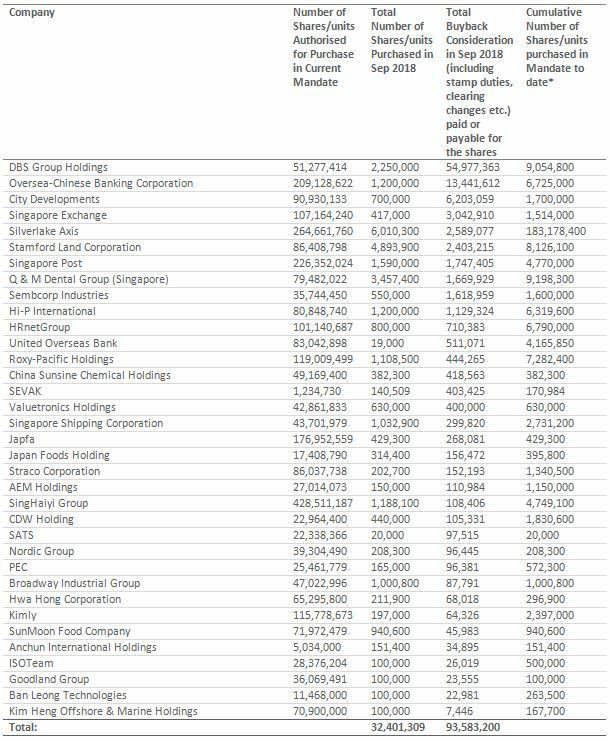 As many as 35 SGX-listed stocks reported buybacks on their SGX-listings over the month, buying back a total of 32.4 million shares. The S$93.6 million buyback consideration was less than half August’s buyback consideration of S$245.4 million which was a 35-month record and coincided with the STI declining 3.2%. During the month of September, the STI gained 1.4% to 3257.1. During the month of September another 9 stocks commenced new buyback mandates. These included China Sunsine Chemical Holdings, Valuetronics Holdings, Japfa, SATS, Nordic Group, Broadway Industrial Group, SunMoon Food Company, Anchun International Holdings and Goodland Group. 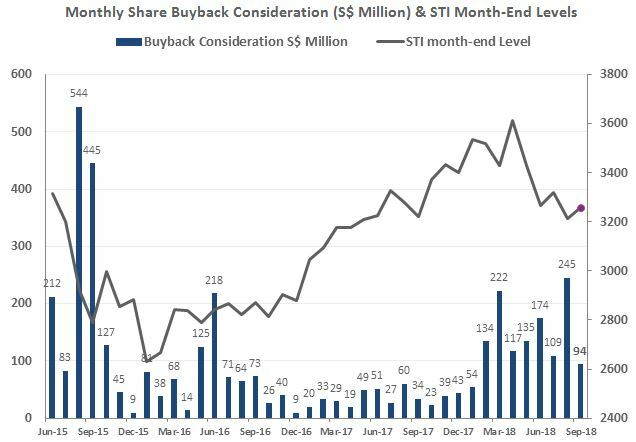 The same amount of stocks commenced buyback mandates in August (click here) with a similar number of stocks commencing buybacks in July (click here). The 5 largest buyback considerations in the month-to-date have been maintained by 4 STI stocks - DBS Group Holdings, Oversea-Chinese Banking Corporation, City Developments and Singapore Exchange, in addition to Silverlake Axis. Silverlake Axisconducted more than S$2.5 million in buybacks during September. Silverlake maintains that over 40% of the top 20 largest banks in South-East Asia run Silverlake Axis’ core banking solution. The Group offers innovative Digital Economy Propositions and Enterprise Solutions to its customers in Banking, Insurance, Retail, Payment and Logistics Ecosystems. Silverlake Axis’ current buyback mandate commenced on 26 October 2017. Since then, Silverlake Axis has bought back 6.92% of the company’s issued shares excluding treasury shares. The table below summarises the buyback considerations inSeptember 2018. The table is sorted by the value of the total consideration amount for the month, which combines the amount of shares or units purchased and the purchasing price of the transactions. Source: SGX (Data as of 30 September 2018).